Motherhood can seem a little monotonous at time. Each day seems like the same routine of doing nothing but acting on the whims of my children. Some days it seems like I'm just trying to survive until bedtime. If I take the time to look back though, I realize how much has changed and happened. We have come so far from the dreaded memories of little newborn Olive with pneumonia and the sickness that hung over our house for months. Olive is now a healthy 4.5 month old who loves to talk. She laughs at everything her brother does and lights up whenever he heads her direction. Taylor has successfully moved into a big boy bed and is starting to put more words together to form sentences. He loves to count and point out different colors. With little humans, so much can happen in just a few days. Although the days seem long, the weeks and months go by so fast. And now, here we are with another event that seemed to take forever, but looking back, went by so quickly. Andrew had his last final for the school year today. We have survived the first half of business school. Now we are off on a 12 week adventure to Ohio for Andrew's internship. I have been more than a little stressed about this temporary move. There are a lot of factors that go into planning a 12 week stay over 2,000 miles away especially when your throw two kids into the mix. 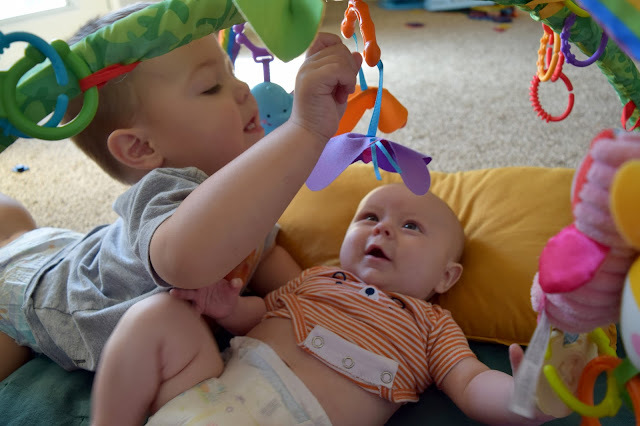 Caring for a toddler and a baby requires a lot of stuff. I wish I could say I have handled everything well and that things have magically fallen into place, but the truth is I have had quite a few meltdowns over the past couple of weeks. Luckily, the move is finally here and I'm just excited to get there so can be past the planning stage. What I hope to take away from all this rambling is to remember each little moment and realize it's importance, even when it seems mundane or insignificant at the time. When things are stressful and it feels like I'm in survival mode, I need to remember how quickly this will go by and how soon I'll be looking back with fondness.